Research is carried out in the Bioengineering Research Centre in University College Dublin, Ireland. The group is within the School of Electrical, Electronic and Mechanical Engineering. Prof. David FitzPatrick is head of the school and our research group. My Ph.D thesis describes the relationship between elbow joint shape and curvature, contact area, and degeneration patterns. Experimental methods to collect raw data of the elbow joint geometry included CT and MRI medical imaging and high resolution laser profilometry of cadaveric parts. 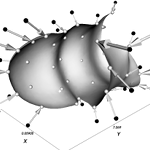 Custom software was written to manage, reconstruct, and analyse the anatomical geometric models. Lawlor, G.J; Carr, A.J. ; FitzPatrick, D.P. and McCormack, B.A.O. – Three dimensional contact areas in the visible human elbow in ‘Computer Methods in Biomechanics and Biomedical Engineering – 3’, eds, pub, 2001, pp. 307-312. Rooney N., FitzPatrick D. P., Lawlor G., Ishibashi H.and Lee J. 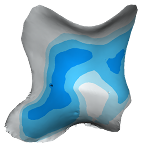 – 3-D size and shape variation in the distal femur: effect of ethnicity, gender and osteoarthritis. Proceedings of the World Congress of Biomechanics. Journal of Biomechanics 2006; Vol. 39 Suppl. 1, pg. S569. Hennessy, R.J.; Lawlor, G.J. ; Lee, T.C. ; Carr, A.J. and FitzPatrick, D.P. – The Application of a 3D Hand-Held Laser Scanner to Human Joint Modelling. Proc IMechE Conference ‘Comrade in Arms’ Conference, London, April 2001. Rooney N., FitzPatrick D. P., Ishibashi H., Lawlor G., Fitzpatrick C., Lee J. and Auger D. – Ethnic Variation in Distal Femoral Geometry: Knee Prosthesis Design. Proc. 52nd Annual Meeting of the Orthopaedic Research Society, Chicago, 2006. Rooney N., FitzPatrick D. P., Ishibashi H., Lawlor G., Fitzpatrick C and Lee J. – Ethnic Variation in Distal Geometry: Knee Prosthesis Design, Proc. Bioengineering in Ireland (12), Galway, January 2006. Eds. P. McHugh, D. O’Mahoney & D. FitzPatrick, pp. 83. ISBN 1-905254-07-5. Lawlor, G.J., B.A.O. McCormack, and A.J. 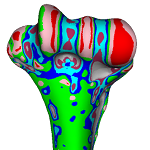 Carr, “Three-dimensional Geometric Computer Modelling of the Articular Surfaces of the Human Elbow Joint.” Journal of Bone and Joint Surgery (Br), 1999 , 81-B, p. 95.